We can be contacted on 01449 780259 or 07867 336261 or email info@gtclassichire.co.uk or click Contact Us We will return your call or email with a answer as soon as we can. Standard collection and return times are 5pm to 5pm, but if different times are required please say so as soon as you can and we will endeavour to arrange for you. Prices are for 24/48hr hires and 9am to 5pm with insurance for one driver, £25 for each additional driver and breakdown assistance. We will require full payment on a booking if less than 8 weeks before hire date. Bookings before 8 weeks will needs a 30% deposite and full payment 8 weeks before the hire date. If for some reason the car that you booked is unavailable for your hire due to mechanical breakdown or other acts of God we will do our best to replace the car with another similar car. Each cancellation will be reviewed within its own merits. 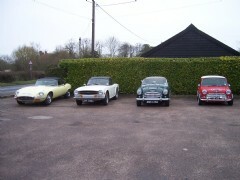 How about a corporate day out in Suffolk with some classic cars. 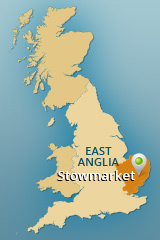 Supplied routes, places of interest, and accommodation arranged. Our gift vouchers make great presents and can be purchased as gifts for Christmas, birthdays, anniversaries or even a wedding present.